Plans by a Conservative council to axe all 19 children's centres have been met with "dismay" by the Labour opposition. 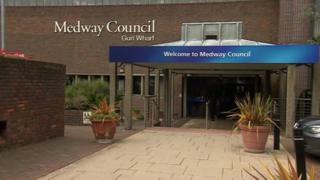 Medway Council said the centres would be replaced by four "super hubs". The move comes after the council agreed a £60,000 cut in funding for children's centres to help pay for the Battle of Medway commemorations. Labour councillors criticised the plans saying a consultation was due to be held while many families were away on holiday. Andrew Mackness, the Conservative lead member for children's services, said: "The super hubs would provide a better range of services in the community." He said the changes were not being considered only for financial reasons. "I look to constantly improve the services and provide appropriate services," Mr Mackness said. He said jobs may be lost if the proposals are approved. Medway's 19 children's centres are mainly based in primary schools. Adam Price, the Labour spokesman for Children and Young People, said: "I would like to express my dismay at the proposal. "The timing of the public consultation from 23 May to 4 July could be perceived as a deliberate attempt to minimise contributions from stakeholders. "Many of the concerned parties, as parents of pre-school children, use the summer term period to go on holiday." He said council meetings at which the proposals are due to be discussed were "in the middle of the school summer break". In the council's budget, which was approved on 23 February, the authority said £160,000 funding for the Battle of Medway commemorations was to be paid for from an additional £100,000 income from crematoriums and £60,000 from cuts to children's centres. There will be 10 days of events in June to mark the 350th anniversary of the battle and 50,000 people are expected to attend.